Our main point of focus in yesterday’s premarket report was a bearish stance on ANF to correspond the company’s earnings miss. We wanted to use the impending selloff to our advantage, and for that we selected the ANF Weekly $22-19.50 Puts. The activity unfolded just as we expected it would, and as a result our observed contracts provided us with nice intraday gain opportunities. While the contracts don’t expire until Friday, this is likely to be a one-day idea that we’ll now be moving on from, as the chances of seeing ANF take another dramatic backslide seem rather slim at this point. We want to circle back today to recap a couple of plays we added to our watchlist on Friday morning. Both have left their lows behind, with each of them going on to register new highs yesterday. Firefish, Inc. FRFS – saw its low on Friday at .0031 and yesterday found its way up .0064, marking a 106% swing in a four session span. Force Protection Video Equipment, Inc. FPVD – This play found its bottom on Monday at .016 before leading into yesterday’s high of .027. That goes down in the books as a three-day, 68% shift to the upside. VEEV posted a 34% year-over-year increase on revenue in this morning’s earnings report, and like usual, we want to signal a range of options contracts to monitor as a result. Our targets are going to be the VEEV 09/16 $39-42 Calls. After noticing this morning’s earnings release from ANF, which included a big shortfall on expected sales as well as guidance for the remainder of the year, we may be interested in taking a bearish stance and using the current sentiment to our advantage with a series of puts. We’re going to place ANF Weekly $22-19.50 Puts on watch as the stock is gapping down more than ten percent in premarket trading. If a large selloff continues to persist, we could be looking at some serious action in these contracts. As long as the stock doesn’t recover past this morning’s premarket high of 22.95 once the session commences, this idea will remain in play. 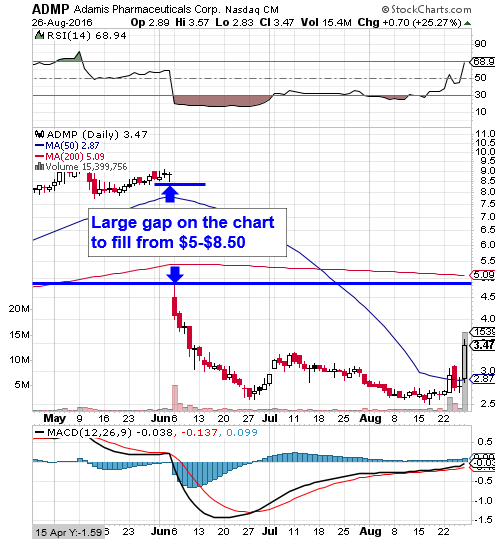 We’ve got an interesting chart setup on this subpenny stock that is sufficient to warrant tagging the play for observation. In addition to forming a fairly strong ascending triangle pattern, there are a number of other bullish attributes of which to take note. 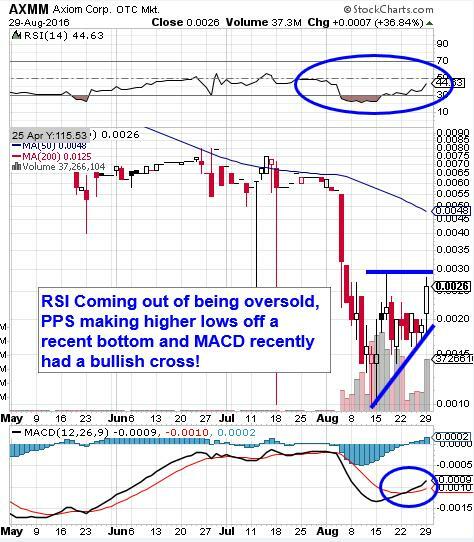 As we’ve pointed out on the following snapshot, AXMM’s coming off of being oversold, and we’re going to want to see that RSI surpass the 50-line. Meanwhile the MACD just underwent a bullish cross, and if we can see a breach of the .0029-mark, there’s little in the way of resistance until you hit .0055, which would also represent a breach of the current 50DMA. FMYR made an appearance in Friday morning’s premarket watchlist, and was ready to make it’s rip right from the starting gun. The stock rapidly spiked 56% from .005-.0078, before dipping back to a low of .0045 and making a 33% swing back to the close at .006. When it was all said and done, the stock ended up trading roughly ten times its monthly average volume. These are the type of volatile swingers that we like to track whenever we find them. When properly timed, these rapid intraday swings can be leveraged into quick profits. We’ll be on the lookout in the event of some momentum carryover from Friday. We’ve got a couple of plays with similar chart setups to tag for extended-term observation as we kick off this new trading week. Each of the following has exhibited signs of rebound action off of fairly recent annual lows, and in each case, a sizable gap on their respective charts is present. We’ve included snapshots of each chart below. 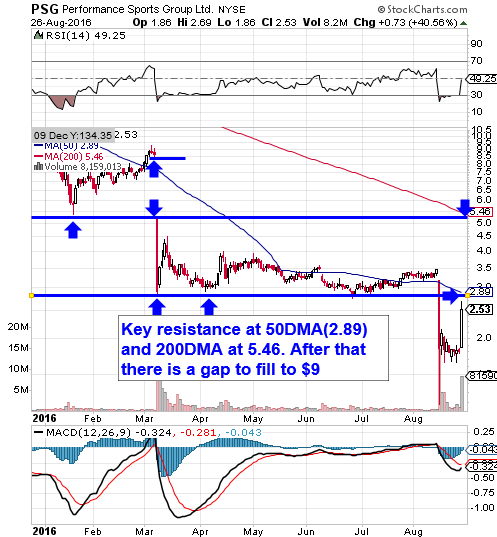 Adamis Pharmaceuticals Corp. ADMP- As you can see, ADMP gapped down hard in June, and followed that up with a selloff to new annual lows later that month. 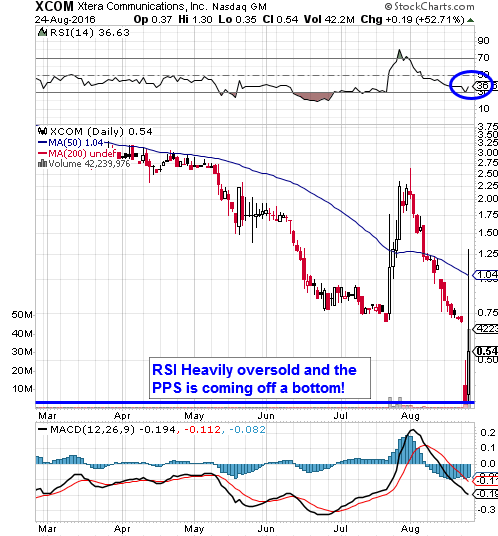 Recently it has been gaining ground off of its bottom, and at present the RSI is on the verge of cracking into the power zone. Performance Sports Group Ltd. PSG - The gap on the chart in this case dates back to March, and it will need to break through a channel of resistance that we’ve marked below to make a run at filling it, but if that were to occur, we’d be talking about gains of several hundred percent from current PPS levels. We caught TIF in the wake of its premarket earnings beat yesterday morning, and summarily issued a quick-strike options trading idea to correspond with the resulting activity. The range we signaled was the TIF Weekly $71-74 Calls, and, as has become a common occurrence for us, we saw each and every set of contracts yield multi-bag, single-session gain opportunities. Caution: In the event that chances remain to milk these plays even further today, just remember the extreme high-risk nature of trading weekly options on a Friday. Yesterday, we were looking for XCOM to continue the rebound it had begun in the previous session, and the stock did end up making a couple of nice intraday swings en route to closing near its high-of-day. Our criteria for being interested in this play was simply that it hold support above yesterday’s premarket low of .60, and that wasn’t a problem for XCOM. Our interest in tracking WEYL will continue provided it maintains support off of the previous resistance at 3.00. Our first order of business this morning is to rehash the recent performance of what has become one of our best picks of this month on the stock side of things. 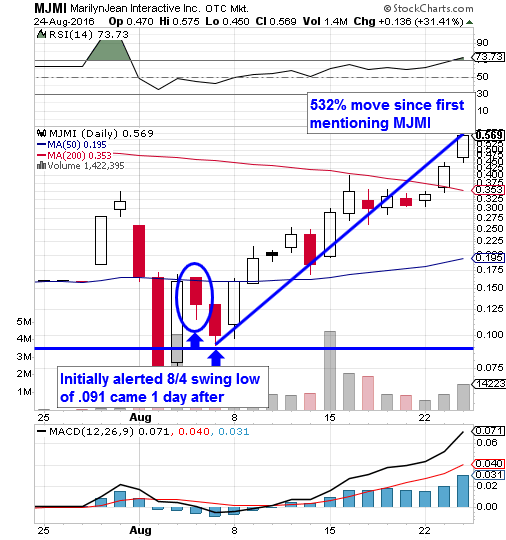 We first alerted MJMI exactly three weeks ago on the 4th, and would subsequently observe a low of .091 the very next session, from which the stock hasn’t looked back. Volume has been excellent during the entire fifteen-session span that we’ve tracked the stock, and yesterday MJMI reached an amazing new high of .575. That works out to a fantastic increase of 532% in a relatively short time. A quick peek at the chart below shows the incredible move clearly. In the event of a pullback off of this latest spike, we’ll be looking for the stock to maintain support at or above the 200DMA of .353. We’re always on the lookout for a good bottom-bouncer, and it appears that we’ve found an interesting candidate this morning, which has just undergone a crazy 48 hours. The stock made a huge run yesterday off of its recently established annual lows, filling the gap on the chart and then some, before settling into close in the fifty-cent range. This morning in the premarket we’ve seen the stock changing hands in the .60-.74 range, so we’re very interested to see how the activity will unfold in-session. We’ll want to see this morning’s premarket low of .60 hold as support on any pullbacks. We also want to provide a quick update on BTHE today, which was a mention in yesterday’s extended watchlist. Fresh Options Idea: Tiffany & Co. Just beat on earnings this morning, so we’ll be montioring the TIF Weekly $71-74 Calls for potential daytrades and/or swing trades into tomorrow.